This custom men’s skull ring has sparkle coming from all directions! 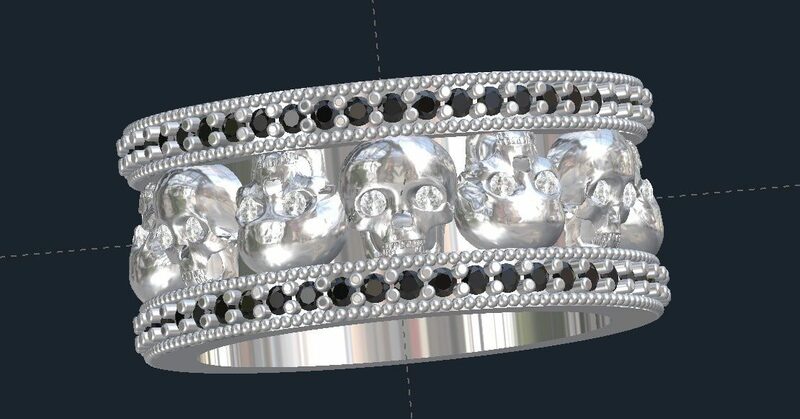 On top of the rows of black diamonds going around the outer rails, there are diamond accented skulls going around the ring. This one is 12mm wide and has 1.5 mm accents going around the sides of the ring. ACCENTS: Around .75-1.25 TCW, depending on the size of the ring and stones. Due to the size, these can only be Diamonds, CZ, Emerald, Ruby, and Sapphire. Looking for another custom skull ring design, you can see more HERE . Click HERE to learn more about custom jewelry, to see more of our portfolio, or to contact us about a custom men’s skull ring. It can cost less than you think to have your very own custom wedding band made just for you. Why hassle with the retail stores for boring and overpriced wedding rings?